Blood For The My Little Pony? A mash up of Dawn of War Dark Crusade sound-bites and My Little Pony (?) animation. Mad as hell! I have been captivated by the Anima Tactics range, and have started yet another blog (Anima Tactician) which can be followed by following this link here. Fear not, this will not mean Pulp Citizen or Eclectic Gentleman Tabletop Gamer being overlooked, but my acquisition of Anima Tactics minis needed an outlet! I already posted this on my Pulp Citizen blog, but thought I would re-post for any who don't read that one. Some things arrived in the post this morning, and among them was this paint rack (bottom picture)! Ah, the smell of burnt wood in the post - laser-cut MDF is on the way then, as any hobbyist should agree! I don't know about other painters, but I have accumulated a sizeable selection of paints over the years. trying to keep them in a manageable order is part of the battle. A few years ago I switched from mainly using GW paints (I still rely on their washes however) to using Vallejo Model Color. A massive range of colours meant a burgeoning array of paints bought over the past few years. That in turn led me to trying out a couple of different paint racks. 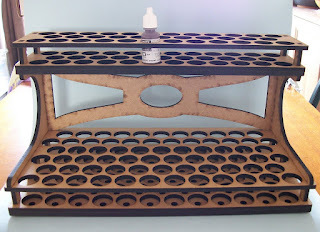 I quite like the ones I had from Miniaturicum, for 30 and 80 bottles apiece (seen among my painting table debris in the topmost image), but the banked design means that the more bottle capacity that a rack gives, the greater its 'footprint' on my painting station. I also tried some CNC designs (their 'corner' efforts), but felt that the design and construction was both flimsy and fiddly so I stopped using those. 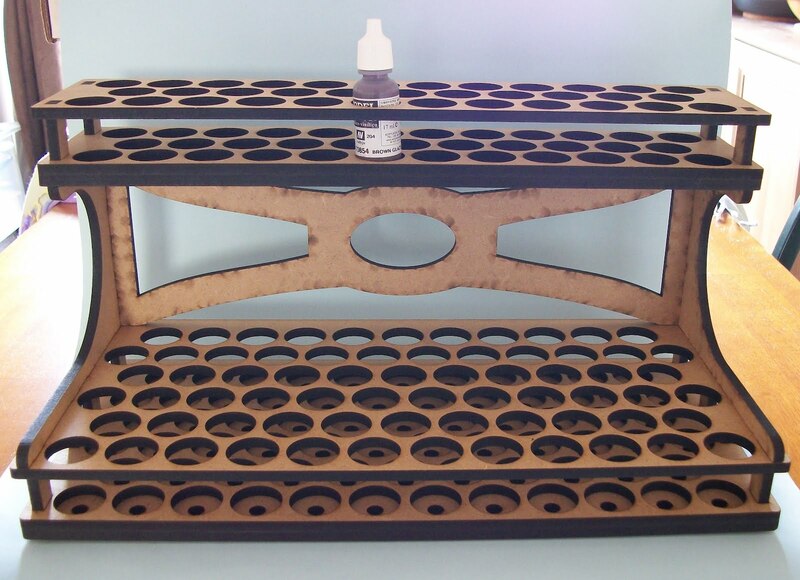 Recently I saw that Iron Mammoth (click for blog post link) had created his own paint rack, and the two-tier design looked just the ticket for me, although without the bottle capacity I wanted. So I shot Iron Mammoth an enquiring PM via Lead Adventure Forum, and after an exchange of emails, we agreed a price on a my bespoke 104 dropper bottle rack, which has a smaller footprint on my work area, and less depth meaning that the way I work with stuff in front of the rack is better accommodated. Very easy assembly and minimal gluing and I am very pleased with what Iron Mammoth delivered. Note that this is not yet a commercially available product, but if you are interested, it may be worth getting in touch with Iron Mammoth.